really wanted the beads to take home for keepsakes, and bragging rights to their friends. Then I discovered last year NOLA pulled 93,000 pounds of beads from five blocks of storm drains. 93,000 lbs of plastic beads in the gutter, which means they are really just common flashers, exhibitionists. The population of New Orleans swells to three times its normal size this time every year, when more than 1 million tourists converge for Fat Tuesday. 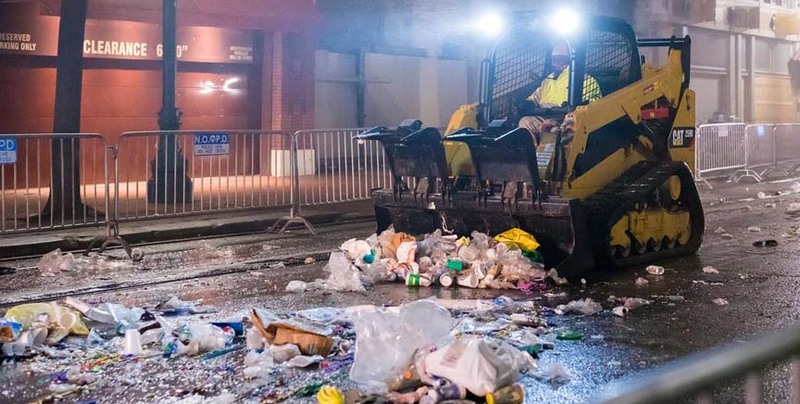 The festivities bring in an estimated $165 million to the city, as well as serious trash, which is why several dozen construction machines stand ready to clean up before the party even gets started. 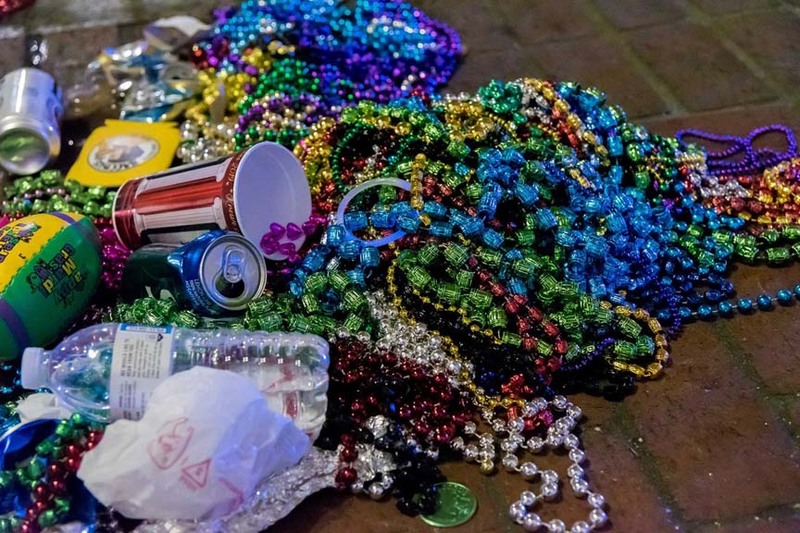 Some 45 million pounds of plastics make their way to New Orleans every year for Mardi Gras, more than half of which consists of beaded necklaces. In January 2018 the city said it had pulled 93,000 pounds of beads from just five blocks of storm drains and more than 7 million pounds of debris overall, the Times-Picayune reported. Recycling is limited, but is drawing more attention, particularly after the city announced the volume of beads trapped in stormwater drains. The city now offers dozens of locations where people can drop off their beads for recycling and, if desired, buyback. An early adopter of recycling was ArcGNO, an organization that creates jobs for children with intellectual disabilities, in part by collecting, cleaning, repackaging, and reselling throws. Much of the throw debris ends up in landfill. In 2013, Naohiro Kato, a Louisiana State University associate professor of biological sciences, learned about the scale of the problem at a Mardi Gras party and began to wonder if naturally produced chemicals might allow production of biodegradable beads. Biodegradable plastics have been around for many years, but their expense would prohibit manufacturing them into what are literally throwaway baubles. Kato said his conversations with other New Orleanians led him into a potential paradox. Many told him that the notion of biodegradable beads was so novel and charming that they would want to keep them forever as unique keepsakes. But keeping them forever would defeat the purpose (and expense and time) of making them biodegradable in the first place. Given the scale of the problem, it’s only a theoretical conundrum for now. “I don’t expect we can replace all the beads, and it’s not necessary,” he said. He just wants to make a dent in the problem. The colors show up as team colors at rival local universities, with LSU known for its purple and gold and Tulane wearing green. An additional color showed up last year. Orange is the new block for New Orleans stormwater drains. After the city realized the scale of the throws problem in early 2018, it laid out $30,000 for 200 “gutter buddies,” water-permeable sleeves of pebbles that keep necklaces and other debris from flowing into drains. A 2014 analysis of how much income Mardi Gras brings to the city concluded that it generates more than 2 percent of New Orleans’s $21 billion gross domestic product. Cleanup-related expenses tallied in the study included more than $230,000 for workers, about $825,000 for equipment, plus other expenses, which brought the sanitation grand total to almost $1.5 million. Total direct economic impact of Mardi Gras on the New Orleans economy $164,274,980 Total direct and indirect impact of Mardi Gras on the New Orleans economy $465,214,106 Percentage of New Orleans GDP 2.22% Tax Revenues Flowing to the City of New Orleans and other Local Government Entities as a result of Mardi Gras $17,596,832. Profitable and an opportunity for the flashers. Amazing. I had no idea the trash problem was so bad. I knew street sweepers came out immediately after the crowds broke up, but the 93,000 lb of beads in the drains is insane. Think of the stuff that is in that trash. 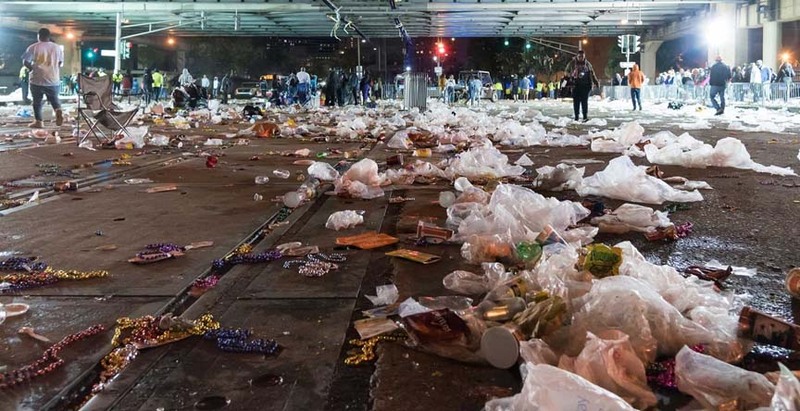 When I read the tonnage they clean up here, Times Square, or any big gathering, then look at the pictures it looks like all paper and plastic. But I guess that's just like the whipped topping, the heavy stuff must be underneath. That reminds me: who has the job of emptying the trash bins in airports? Like, the ones in the hall, just before the security checkpoints? The guy driving the Rolls. ...the one driving the Rolls. Once, while having one last smoke before heading inside and going through the security checkpoint, I saw a pre-roll container in an airport ashtray. I didn't open it to check if anything was inside, but seeing it there made me laugh. There's no reason they can't change the plastic beads to folded paper which is eminently more degradable, burnable, and recyclable. Lighter too for the big breasted enabling them to carry more. Not sure that's a good idea, aren't some people smoking or eating or something unhealthy those bath beads? Wait, maybe it's salts, bath salts. ...but the streets wouldn't smell nearly as great.